One anecdote I always seem to save, like the proverbial ace up my sleeve, is how I once played myself in a movie. Admittedly this is a small, locally shot, independent flick, but a movie on IMDB nonetheless. The movie remains near and dear to my heart because it’s a relic of my younger and crazier days (for the record, I am the Xena-obsessed girl in the synopsis.) It’s almost like a greying hippie recalling her glory days at Woodstock. What I’d nearly forgotten, and remembered upon watching the film again recently, is its depiction of furry culture. For any laymen present, “furry” does not refer to a subculture of geeks who refuse to engage in shaving or waxing. I’d describe it, but this entry pretty much tells you all you need to know. One of the original "fur flicks"
I know what you guys are thinking, that this is my way of “coming out of the fur closet” or something like that. It really isn’t. But I’ve been forced to re-examine my own Furry tendencies…and what I find is slightly eerie. Back in the day, I’d watch certain movies and TV shows ad nauseum until I could repeat them word for word (much to Mom and Dad’s chagrin). 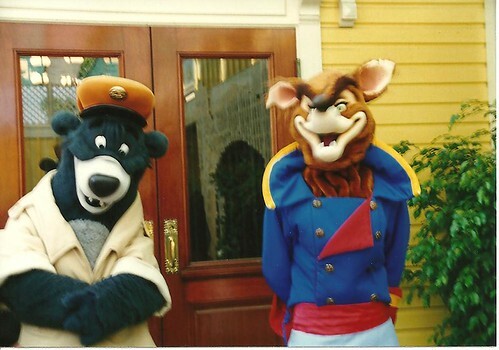 Almost unanimously these were “furry-friendly” selections, from the Disney version of Robin Hood and later Disney Afternoon with its plethora of half-hour anthropomorphized animal shows (TaleSpin being my favorite). I couldn’t get enough of the talking animal stuff. That being said, I never really had the burning desire to dress in a fur suit and meet other “furries.” There are entire conventions for those of the furry persuasion, just as there are cons for comic geeks, RPG’ers, and cosplayers. From what I can gather, fur is big business. For other people. I suppose there are plenty of examples of furry culture being mainstream, from life-size Disney World characters to Japanese manga to even the ancient Egyptian pantheon. There’s something downright magical about human beings taking on the qualities of animals. In many shamanic cultures, it is necessary for the practitioner to do this. And I have to admit, the image of a shaman wearing an animal headdress never fails to awe me. I think that furries, like every form of geekery, have their limits. There’s a difference between living the life of a shaman or watching classic Disney cartoons and, say, insisting on wearing one’s fox tail and ears in public and insisting upon being referred to as “Vulpix Darksighter.” Just like we wouldn’t wear our Federation dress uniform or our emerald-bladed lightsaber to mundane events. Well, at least not most of us. Furry culture is the same as any other geek culture to me. I may not fully understand it, but as long as it involves consenting adults and nobody gets hurt, GO FOR IT. I just have no real desire to participate in it. And now that I’m older and my con-going days become fewer and fewer, that goes for just about every form of in-person interaction with fellow geeks. I can’t justify the gas money or the big bucks for cosplaying that could otherwise pay for house repairs or sensible groceries. If you are a Furry or know a Furry, more power to ya. And I promise to use your Fursona name when appropriate. Me? I think I have dibs on “Dawn Karnage,” but haven’t Googled to find out yet. I am so seriously geek. What are your secret geek indulgences? Any weird convention stories to tell? Send ’em and you just might be featured in a future episode of P&Q. As always, if you enjoyed this post, click that “Like” button and subscribe, eh, mon ami? ~ by Howlin' Mad Heather on March 8, 2012. I’m not a furry, but when my oldest child was but a tot, i used to think the kangaroo on Zoobilee Zoo was pretty hot. Oo-de-lally, oo-de-lally, golly what a day! 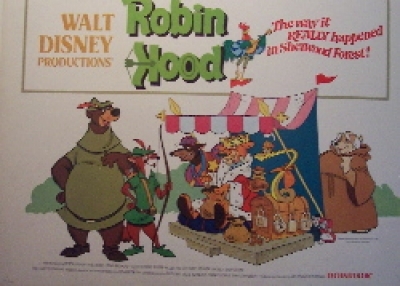 Robin Hood…the underappreciated stepchild of Disney movies. Tailspin!!! I loved that show! It was steampunk before steampunk. I’ve never done the furry thing, though I think its detractors make way to big a deal. I was into the Minds Eye Theater for a bit, that LARPing for the World of Darkness RPG. I played a Vampire with a split personality. No one (including me) never knew which personality was the real one, but the two were brothers, the one having killed the other right after their “embrace.” One personality was Tommy Gunn (yeah, yeah, I know, cheesy) a prohibition era Irish mobster and overall psychopath. The other was his pacifist, priest brother, Michael. I’d switch personalities at the most inopportune times for my friends, to Michael when we needed to fight, and to Tommy when diplomacy was called for. It was fun. That sounds awesome! I think LARPing in general is a hell of a lot of fun, I just prefer to do it outside of a fursuit. And yeah, TS is very steampunk in the 1930s, isn’t it? I never wore the uniforms or anything, but I’m sorry to say I have attended one or two Conventions in my time. It was only a joke but, to my everlasting shame, he died a week later. Oops! Sorry Jon. I am a Trekkie, Star Wars, and Matrix nerd.